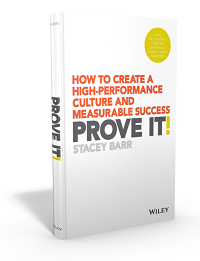 It will be a torrent of ‘yeah-buts’ – basically, objections to giving time, money or effort to performance measurement. Are you going to sit back and take it, or do something about it before it even happens? OBJECTION 1: Performance measurement hasn’t worked in the past. What’s happening with this objection is that the person is assuming that because there has so far been no successful approach to performance measurement, that means there can’t be a successful approach in the future. Your focus should be on raising and challenging this assumption, and offering an approach to performance measurement that acknowledges the causes of failure and show how that approach solves those causes. OBJECTION 2: We don’t have time for performance measurement. At the foundation of this objection is the assumption that everything people are currently doing is of a higher priority than performance measurement. We already know that people spend a lot of time on urgent things that aren’t in alignment with strategy or that are rework resulting from ineffective or inefficient processes. You simply need to highlight how good performance measures can reduce the time wasted on these kinds of activities, and therefore is of a higher priority than these activities. OBJECTION 3: We already know what matters, performance measures won’t tell us anything new. The assumption propping up this objection is that just by looking around or relying on our experience with the work we do, we can see and know everything that matters. But the truth is, we all have biases caused by our values and moods and what we notice and what we don’t notice. And these biases prevent us from seeing objectively the patterns and trends that data can show us more quickly and easily. It’s not hard to demonstrate this with a few examples of how data has led people to surprising and valuable insights they otherwise would have missed. Be prepared, respectful, honest and focused on the big picture. Handling objections to performance measurement requires that you dig a little deeper to understand the assumptions people are making that lead to their objections, raising those assumptions so everyone realises they are there, and then stimulating some dialogue to move beyond the objection. It’s not about being a smarty-pants or winning a debate with the person who voices the objection. It’s about elevating the dialogue to a constructive level, so you can all get a better understanding and movement forward. Which of these three objections is blocking your path to better performance measurement? Take pen to paper for 15 minutes and prepare some well-informed, respectful and constructive responses to the ways you expect this objection to be expressed by your managers or colleagues. One of the reasons supervisors and managers do not “have time” is they are performing tasks that their staff should be doing, ergo, they are not “managing”. Performance measurement and management is MANAGEMENT…and supervisors and managers have to learn, and understand, this is their principal responsibility. The greater percentage of their daily routine should be committed to “management tasks”…and one of them is performance management. If you accept the title of manager, get paid management wages, then “manage”. 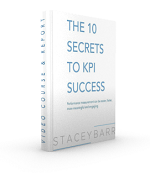 Sign up for the Measure Up newsletter and get free access to the "10 Secrets to KPI Success" online course and e-book. 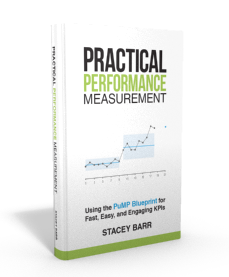 Order Practical Performance Measurement here. Haven’t found what you’re looking for? Want more information? Fill out the form below and I’ll get in touch with you as soon as possible. *We respect your email privacy.